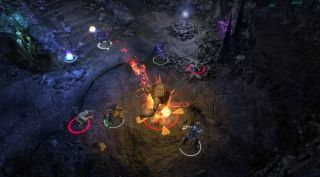 A pair of new Sword Coast Legends gameplay videos offer an "extended look" at the game's campaign creation toolset, and illustrate how it will play from the Dungeon Master's perspective during a "real" dungeon run. The Campaign Creation video highlights what appears to be a very flexible campaign editor. Players can create and customize dungeons with various sorts of highly-detailed detritus, place and modify merchants, quest givers, and monsters, and string together individual encounters and quests into a larger, overarching campaign. Encounters can be left at default or built entirely from scratch, as can individual monsters in dungeons, via the game's "Creature Creator." Once complete, the campaign can be modified on the fly by the Dungeon Master. We've already seen how this system will work, but this new video is more of a "live fire exercise," as a group of four players embarks upon the adventure just built, while the DM manages the campaign separately. The nature of "threat," the resource used by DMs to modify dungeons, is clarified a bit, as are the DM's abilities: Traps cannot be dropped directly on players, for instance, and once the party enters a room, the default encounter can no longer be changed. It looks impressive, and increasing or decreasing "threat" based on a party's success (or lack thereof) is an interesting way to go about limiting the Dungeon Master's powers. After all, it wouldn't be much fun if the DM could drop the hammer at will on a party that's been hanging on by a thread from the word "go." Sword Coast Legends comes out on September 8.